It had three pieces of writing on it that said the same thing in three different languages. One was in an Ancient Egyptian script called demotic, the local language of the people in Egypt at that time. The other two languages were hieroglyphics and Ancient Greek. The complete Greek text, in English, is about 1600–1700 words in length. The text is a royal decree from the Hellenistic period about the taxes of temple priests. It gives them back the tax privileges they had earlier. 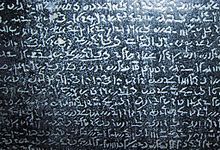 Some scholars believe that several copies of the Rosetta Stone might exist, as this proclamation must have been made at many temples. The soldiers who discovered the stone were part of Napoleon Bonaparte's 1798 campaign in Egypt. It was transferred to the British as part of the surrender arrangements when French forces were caught in Alexandria by the Battle of the Nile and a larger force of British and Ottoman troops. The surrender and treaty is called the Capitulation of Alexandria. Under the treaty, the French had to hand over their archaeological discoveries to the British, and that included the Rosetta Stone. The discovered part of the stone is 114.4 centimeters (45 in) high at its tallest point, 72.3 centimeters (28.5 in) wide, and 27.9 centimeters (11 in) thick. ↑ "Translation of the Greek section of the Rosetta Stone". www.reshafim.org.il. ↑ Wilson, Robert Thomas (1803). History of the British Expedition to Egypt (2nd ed.). London: T. Egerton. pp. 346–353. Retrieved 18 November 2013. ↑ "Text of the Rosetta Stone". Retrieved 2006-11-26. This page was last changed on 3 April 2019, at 05:17.